Bruce Peterson was elected as vice president at the St. Louis in 2018. Previously, he served as second vice president, treasurer and secretary to the Fraternity. He also served on the Arch Chapter from 2007-2011 as Northern Division president and as chairman of the Committee on Chapters. As an alumni volunteer, Peterson has served as chapter advisor, division vice president, and house corporation president and director. He was also president of the Milwaukee Alumni Association from 1976 to 1980. 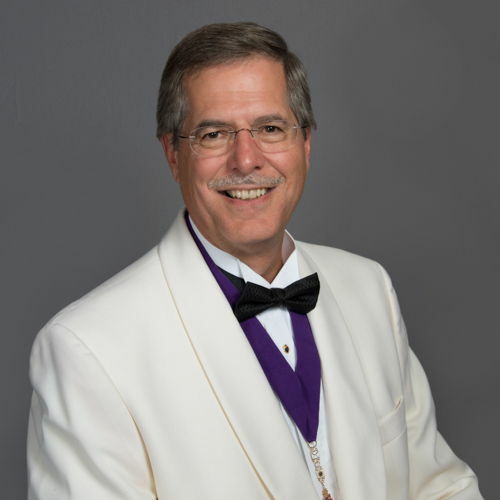 Peterson has attended 19 Karneas and was the 2000 Karnea Chairman for Ritual committee chairman and the 2006 Karnea Chairman for Future of Fraternity Committee. He also served as a member of the Sergeant of Arms Committee for three Karneas. Peterson has attended numerous regional and divisional conferences, the Fisher conference, and the 2006 and 2010 Presidents and Advisors Retreat. He was cited into the Distinguished Service Chapter in 2012 and received the Bill Fraering Award in 1986 for outstanding service from a young alumnus. Professionally, Peterson retired from SBC in November 2000 with 28 years of service. His last held position was Executive Director of Business Development. He was also the vice president of IT Planning and Strategy for ServiceMaster for seven years. He is serving as CIO for Uline Shipping Supply Specialist in Pleasant Prairie, Wisconsin. Peterson achieved a bachelor’s degree in education from the University of Wisconsin-Milwaukee in 1975 and a MBA in 1999 from Keller Graduate School of Management. As an undergraduate, Peterson served Epsilon Tau as president, vice president, and treasurer. Peterson resides in Crystal Lake Illinois and is married and has two sons.